Quick Ship Availability for this Model! 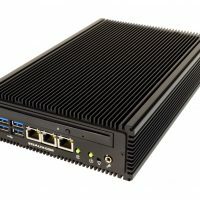 Fanless by design! 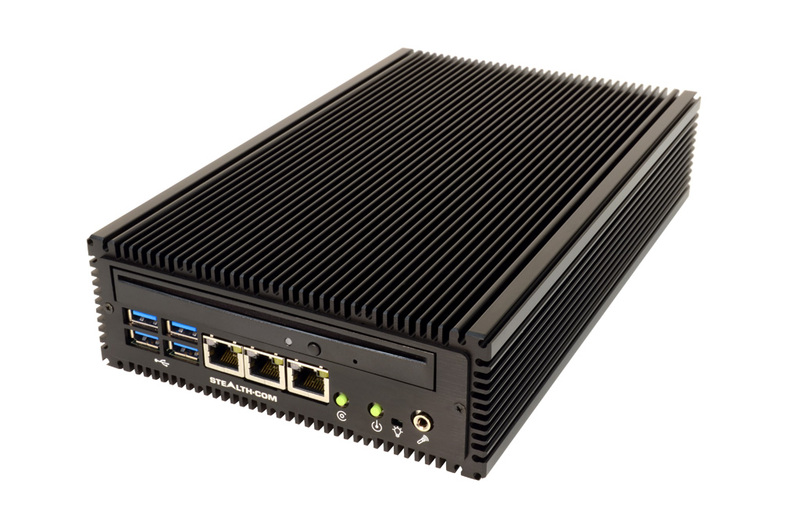 The Stealth Computer model LPC-480G4FS is a highly reliable, fanless, energy efficient, rugged mini PC and features a total of four (4) GB Ethernet ports, (3-Front & 1-Rear) ideal for a myriad of applications such as security, VPN, network appliance, bandwidth controller, network diagnostics and mini servers to name a few. 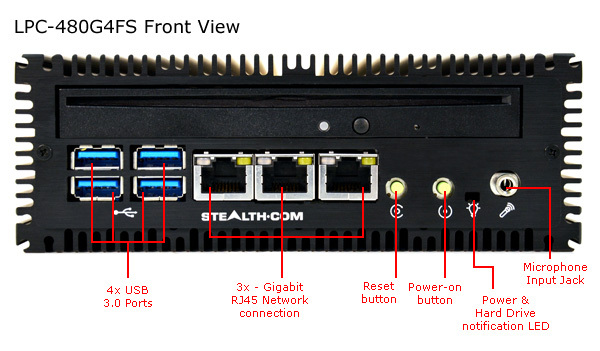 Stealth’s LPC-480G4FS is a small sized computer that operates without noisy cooling fans that can therefore draw in dirt and dust causing catastrophic failures. 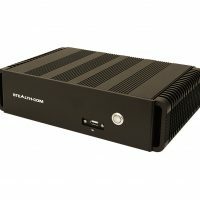 Stealth’s fanless computers are encapsulated in a rugged extruded aluminum chassis that performs as a heat sink to dissipate internal heat build-up. 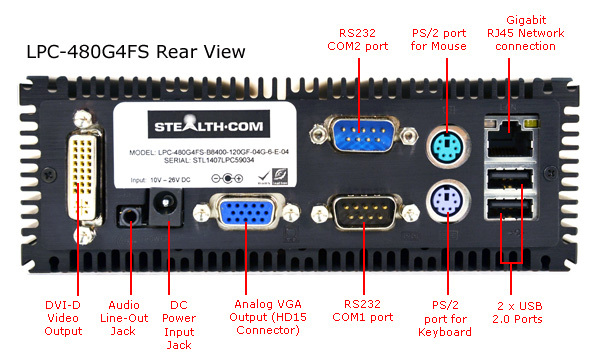 The Stealth LPC-480G4FS Little PC is packed with features including a front loading optical drive, 4 USB 3.0, 2 RS232/Serial, 4 Gigabit LAN ports, equipped with a 256GB SSD (Solid State Drive), 8GB of memory, Intel HD graphics, audio in/out and much more. 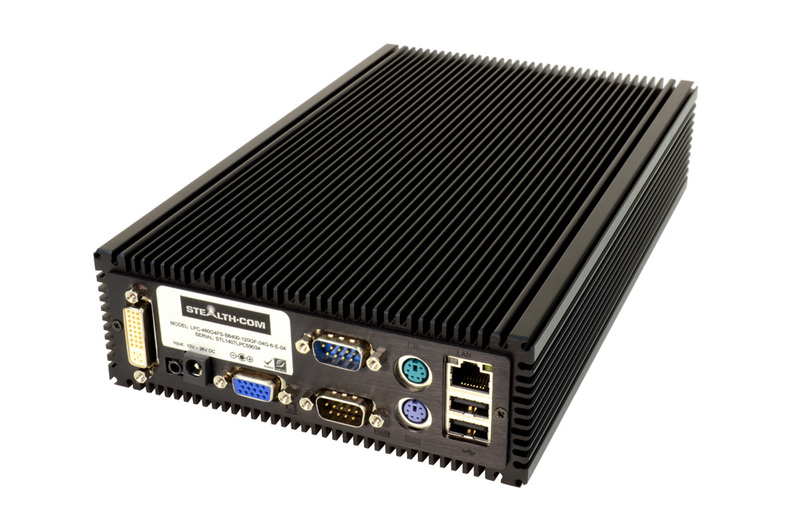 The LPC-480G4FS is an excellent choice for industrial and commercial applications which include, HMI, Embedded Control, Digital Signs, process control, Interactive Kiosks, and Thin-Client applications. Options of up to 1TB SSD internal storage. Charting the CPU performance for all our Fanless LittlePC Models. Models: LPC-700F, LPC-630F, LPC-480FS, LPC-480FM, LPC-625F, LPC-460FS, LPC-460FM, LPC-460G4FS, LPC-525F and LPC-125LPFM. 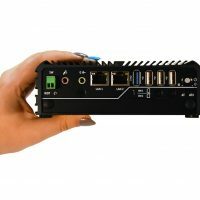 List of supported video resolutions for the LPC-480 LittlePC series. Audio driver for Windows 2000, XP and Server 2003 both 32-bit and 64-bit systems. Audio driver for Windows VISTA, 7 and 8 for 32-bit and 64-bit systems. Chipset drivers for the LPC-480 series. Used with Windows 2000, XP, Vista, 7, 8, Server 2003, Server 2008 and Server 2012 for 32-bit and 64-bit systems. Intel Management Engine Driver for Windows XP, 7 and 8 32-bit and 64-bit.